Ronnie O'Sullivan is "living on a different planet" as he talks of launching a breakaway snooker tour, according to Judd Trump. Trump, the world number five, was commenting after O'Sullivan claimed on Sunday that he was "ready to go" and kick-off a Champions League-style tour for the sport's leading players. Unhappy with playing conditions at venues he considers remote, along with a 128-player flat draw, O'Sullivan reckons he is "just waiting for four or five unhappy players" to join him. The five-time world champion, still the sport's best and most popular player as he approaches his 43rd birthday on Wednesday, spoke of enticing Stephen Hendry out of retirement to join him, as well as great friend and rival John Higgins, who is currently considering ending his career. O'Sullivan says making players of Higgins' standard qualify for events is akin to asking Roger Federer to "qualify for Wimbledon at Richmond Park" and insists he will be patient with his plans. Trump, who beat O'Sullivan in a thrilling Northern Ireland Open final a fortnight ago, thinks he may be waiting a long time. "I think he's living on a different planet to the rest of us," he said at the UK Championship in York, where O'Sullivan plays in the third round on Monday. "Money's not an issue to him, he can take chances, he's got such a strong following he's always going to be able to earn money in the game, he's got absolutely no worries. "I think he's a bit on his own there. Personally, I think what (World Snooker boss) Barry Hearn has done is amazing for us, the money is going up every year, conditions have been a lot better recently, tables are playing well. I'm more than happy with what's going on and how I'm playing. "Obviously you'd always be happy to have another tour on the side, earning extra money, but for most of the players I think we're all pretty happy." There has been no response from Hearn, or World Snooker, in response to O'Sullivan's comments, though it is unlikely that the matter will not be mentioned again over the remainder of the UK Championship, the sport's second biggest title which O'Sullivan has won six times and pays £170,000 to the winner. "You don't see Leyton Orient turning up to play (Lionel) Messi at Barcelona. They might play in the FA Cup, not week in, week out. 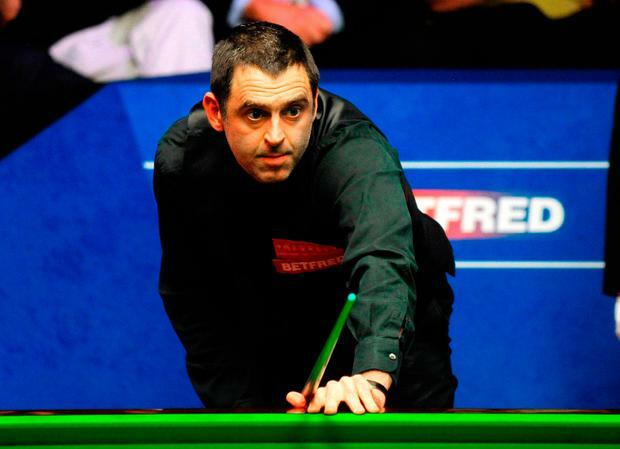 It's demotivating," O'Sullivan added of top players entering a flat draw. "I think Messi would get fed up having to come out and play Huddersfield Town and Leyton Orient. He wants to play against (Cristiano) Ronaldo, hear that Champions League music. I think there's room for two tours." O'Sullivan was focusing only on his third-round match against Zhou Yuelong on Monday afternoon, telling Eurosport: "This is where the tournament gets going a little bit, the last 32 players and in the groove." As ever, O'Sullivan's comments did not stop him receiving a raucous welcome when he was introduced to the crowd at the Barbican Centre. Freddie Keighley Ronnie O'Sullivan has said he already considers himself semi-retired ahead of his first hurdle in a quest for a sixth World Championship title this afternoon.